Alfalfa/hay, corn, wheat, oats, barley, sorghum (incl. milo), rice, soybeans, flag, sunflower and other oilseeds. Total U.S. corn and soybean planted acreage, accompanied by an analysis of total U.S. genetically engineered variety use trends followed by total potential U.S. non-GMO planted acreage. 2016 Non-GMO corn and soybean planted acreage by state (for largest producing states only - approx. 13 states). The USDA Economic Research Service last published aggregate U.S. organic acreage figures in 2011. Despite annually reporting conventional crop planting intentions in early spring, actual planted and harvested later in the year, USDA ERS does not report figures for acreage in the National Organic Program. With the launch of the redesigned Organic Integrity Database, farm-level detail such as certifier names, lists of certified crops produced and contact info are readily available. 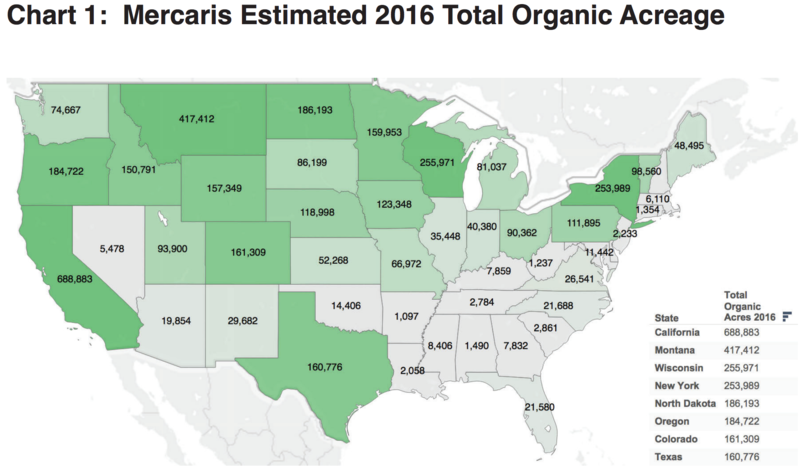 By measuring the number of currently certified producing farms, Mercaris has come up with state and national level estimates to current planted acreage by estimating average farm sizes using the 2011 and 2014 Organic Survey reports. This report uses a snapshot of the real-time certified list of all active organic producers (as of June 2016) to estimate the number of organic farms in the U.S. Keep in mind that the number of organic certified farms is updated monthly by the Agricultural Marketing Service. As the number of certified farms changes, so too will our estimate to organic acreage. We will revisit our figures for the 2017 crop year next spring/summer.